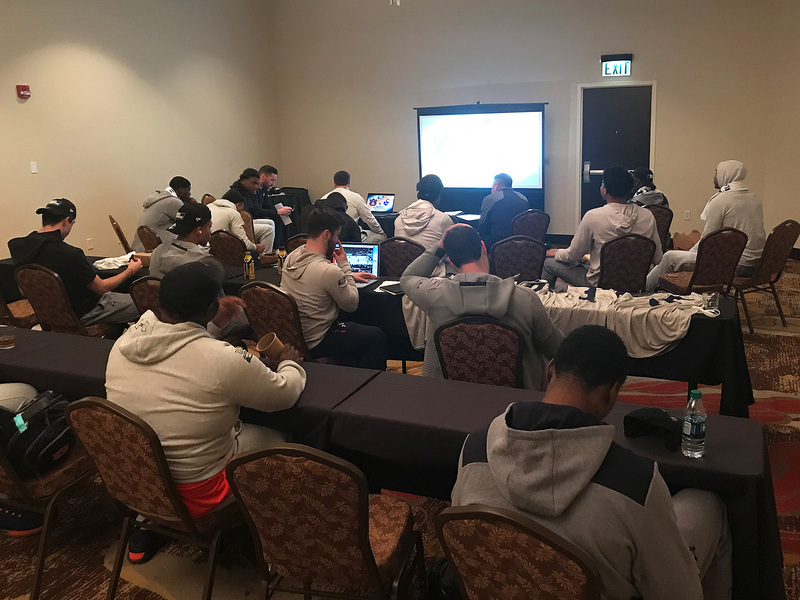 A deep tournament run has been a long time coming for Bruce Pearl and the Tigers, who cruised past Kansas in the second round and has other college basketball bluebloods in their sights. SALT LAKE CITY — Bruce Pearl’s voice has recovered in the 40 hours or so since he screamed his vocal chords raw during Auburn’s last-second, first-round win over New Mexico State. His players’ legs? He’s not as sure about their condition. The Tigers’ second-round matchup against Kansas is 10 hours away. It’s the Tigers’ sixth game in 10 days, which is why Pearl scheduled team breakfast for 10:00 a.m.
Pearl accepts that most of the well-documented adversity he has experienced in his professional life over the years has been self-imposed, just as he accepts—and the Auburn athletic department that employs him accepts—that the recruiting scandals in which he has been involved must be mentioned in any discussion of him that lasts more than a few minutes. In the late 1980s, as an Iowa assistant, Pearl reported an Illinois assistant coach to the NCAA for recruiting violations, which were never proven true or punished. That ordeal damaged Pearl’s reputation among his coaching peers and effectively got him blackballed. Twenty years later, after paying his dues, winning multiple championships in the Division II and mid-major ranks and landing the head coaching gig at Tennessee, Pearl committed violations of his own. He hosted a recruit at his home and asked the recruit (Aaron Craft, who would star at Ohio State) and others to lie about the visit. Then Pearl lied to investigators about it himself. When lesser violations surfaced, Tennessee fired Pearl in 2011, even as local fan polling showed overwhelming support for him. And not just because he’d taken the Vols to three Sweet 16s, either. The ebullient Boston native had ingratiated himself to the Knoxville community, raising awareness and money in the name of cancer prevention, and yelling himself hoarse (and famously painting his bare chest orange) in support of Tennessee’s womens’ athletics programs. Jared Harper is the Tigers’ unquestioned on-court leader, the point guard who resembles the Marlo Stanfield character from The Wire and has the same cold-blooded stare. Chuma Okeke is the sophomore starboy with the Grant Hill game and the brightest NBA future on the roster. Bryce Brown is the Tigers’ leading scorer, a slashing sharpshooter who instead of complaining about being under-recruited out of suburban Atlanta exacts his vengeance with his right elbow and wrist. Malik Dunbar is the off-court ringleader who has just started a boisterous game of tag with two teammates in the corner of the dining room. Brown, the high-scoring senior two-guard, is the last player to arrive at the film session, as per usual. He’s never late, one staffer says, but he’s “dangerously on time, down to the second.” Which for most head coaches, means late. Not Pearl. To the next ballroom they go, where white tape has been affixed to the carpet to form a makeshift key. Walk-ons wearing the numbers of Kansas’s starters waltz under chandeliers, allowing the Tigers to work on defending inbounds plays and working through screens. The elevators ding, and the players head to their rooms to watch Florida, a team they went 2–0 against this season, lose to Michigan. When the room empties, Clay Sanders, a Salt Lake City-based bus driver whose employer provides chauffeurs to the eight teams at this regional, boasts about his plum assignment. All week, his colleagues have had to wait in their parked buses, outside the arena, during practices and games. Pearl invited Sanders to Auburn’s practices and gave him tickets to their games. Good seats, too. “He has made an Auburn fan for life,” Sanders says. Tipoff is less than two hours away and Sanders is steering his steel beast through downtown Salt Lake, carrying a team with no McDonald’s All-Americans on it to face a team whose roster boasts five. Snow-capped mountains fill the windows, every pane a painting. The only sound is Dunbar, in the back row, rapping “Toast Up” by Gunna, a capella. They play with one of your partners, you gon' ride ain'tcha? Ten minutes to tip. Pearl finishes scribbling his game plan on the whiteboard in the locker room and turns to face the thirteen post-adolescents who have bought what he sold them. They sit rapt, hands in their laps. It’s over quick. The Jayhawks holds their only lead, 2–0, for exactly 18 seconds. Then the roof crumbles on them. Brown drains four threes in a three-minute span. Somewhere in there Okeke swats a shot by Lawson (his teammate on the College Park [Ga.] Rim Rockers, when they were 11 years old) and Harper sprints out of the pack like a thief. Guard Samir Doughty lofts a full-court outlet pass that the 5'10" Harper collects and dunks angrily. It’s 23–9 Auburn, and you can almost hear the TV executives groan. But Benihana two nights in a row can bring consequences, and Brown’s stomach knots up in the second half. He sits for a few minutes, wincing. No matter. When the final horn sounds he has 25 points, including seven threes, most of them in transition. Auburn wins by fourteen. Thirty-two of their 89 points come on the fast break. “Sweet 16, boyyyyy!” Brown croons as he bursts into the locker room following his postgame interview junket. “Late as usual,” someone jokes. His voice is a mess again. He’s asked about returning to the Sweet 16 for the first time in nine years, since things went sideways in Knoxville. He shrugs and looks at his son Steven, the assistant coach he assigned two days earlier with the task of studying Kansas film until Steven’s eyes burned. Then Pearl looks at the players, who are beaming and dancing and removing the March Madness name plates from their lockers. “We prepared well,” Pearl says. Then he shrugs. He’s out of words and his larynx is shot.